For San Diego Zoo Global Academy, the year is off to a busy start. We are pleased to announce that the University of Arizona is now part of the Academy, joining other leading universities that offer Academy courses to their life science and natural science students. You can see what Professor John L. Koprowski, Ph.D., of the University of Arizona's School of Natural Resources and Environment has to say about this new relationship at Academy Testimonials. We are also happy to report that the development of a custom rattlesnake transport box is nearing completion, and an Academy course about using it will be available soon. We are especially delighted to introduce Andy Goodman of The Goodman Center as a new contributor to this Academy newsletter (see his piece on the "Laws of Storytelling," below). I met Andy several years ago, when he did a presentation about the value of storytelling for San Diego Zoo Global senior managers. I was intrigued, because at the time I was involved in creating a new team that would be responsible for the interpretation of our plant and animal collections. Of course, interpretation is another name for storytelling. To this day, I still have my handwritten notes from Andy's presentation. One thing we learned was that for humans, there is no greater communication vehicle than a good story, skillfully told. In a salute to Andy's influence, I offer this story. Every Tuesday evening, my son and I look forward to watching the next installment of The Curse of Oak Island. This TV show is the story of two brothers and the unexpected discoveries and hardships they encounter as they seek buried treasure in Nova Scotia. It's a journey of following clues and seeking an answer to questions about the history of that remote place. It occurs to me that the rhinoceros tissue preservation project that I wrote about last month is also a quest: a type of biological treasure hunt. Recently, I met with Barbara Durrant, Ph.D., Henshaw endowed director of Reproductive Sciences at the San Diego Zoo Institute for Conservation Research, about this project. Barbara is a superb teacher, and I was hungry to learn more about rhino reproduction, including the challenges she and other researchers face in understanding the convoluted reproductive tract of female rhinos. I've known Barbara for over 30 years, and our conversation was easy and relaxed as we talked until it was getting dark. Barbara patiently answered each of my questions, even though her responses created multiple new ones. During the discussion, I had the thought that this project must be at least as technically challenging to these scientists as landing an astronaut on the moon was to NASA scientists in 1969. Of course, the Rhinoceros Tissue Preservation Project is just one small tributary of the larger stream of global efforts taking place to save rhinos from extinction. Like all these efforts, this project is greatly accelerated by the crisis every rhino is facing in the wild. Upon its death, a rhino's final contribution to all future members of its species may well be the biological treasure that is hidden in its reproductive cells. However, there are fewer than 12 hours available in the quest to extract, prepare, and preserve these oocyte cells after a rhino dies. With the evening shadows falling, I leaned across the table to Barbara and almost whispered my final question. "If this project produced only a single viable rhino oocyte, would it be worth all your efforts?" Her face brightened, and she replied, "Absolutely, yes." This is true treasure—the stakes are high, and failure is not an option. See Barbara Durrant's course on Rhino Tissue Preservation for the Academy here. The Caldwell Zoo in Tyler, Texas is part of the Academy's collaborative learning environment! Fred Shaffer, manager of staff training and development at the Houston Zoo; and Jon Prange, director of San Diego Zoo Global Academy, are scheduling conference calls this year to discuss training opportunities online, at facilities, and in our industry. The opportunity is to leverage the Academy platform and training opportunities via regular conversations and increased collaboration. Our next conference call will be on Wednesday, February 28, at noon, Pacific standard time (PST). Please join us if this sounds like it could be of interest to you and your organization. Please join us for the Administrator's Users Group Webinar, hosted by Academy partner CypherWorx. The next webinar is Wednesday, February 21, at 11 a.m. PST. Lemurs are loveable—whether they are leaping, grooming, vocalizing, playing, or basking in the sun. They are also the world's most endangered group of mammals. How much do you know about Madagascar's only native primates? 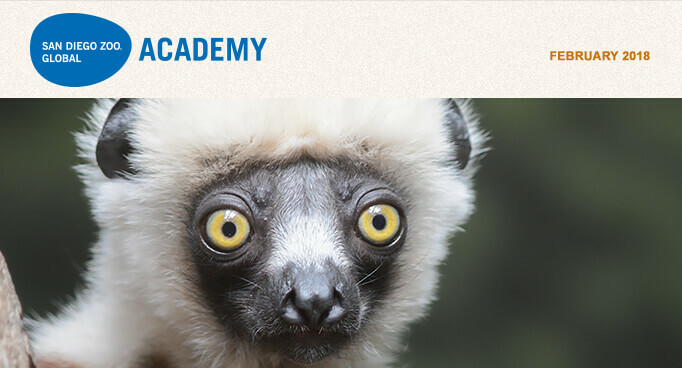 Keepers, interpreters, guides, and docents can explore the life of lemurs, as the San Diego Zoo Global Academy presents the newest module in Introducing Animals, our series about animal species and other taxonomic groups. Introducing Animals: Lemurs explores the behavior, ecology, reproduction, and conservation of these unique animals. Leap into their wild world and discover fascinating details. Remarkable images show lemurs in ways you may never have seen before, and video provides insights into their behavior. Interactivity sprinkled throughout the modules engages participants in the learning process, and questions at the end of each section ensure that they have mastered fundamental concepts before they move on. The Lemurs module takes about 90 minutes to complete, although participants progress at their own pace and may repeat the entire course or sections of the course as many times as they like. Introducing Animals: Mammals is a recommended prerequisite. This module can easily be integrated into your current training program. Providing online modules that team members can complete anywhere and at any time overcomes one of the major challenges of training: getting all participants together in one place at one time. At the San Diego Zoo and Safari Park, participants complete online modules on their own before attending group training programs. They are able to master key vocabulary and concepts, giving them a solid foundation that allows them—and their trainers—to make the most of in-class and on-site training. You can view samples of the modules here. For nearly 20 years, I have led storytelling workshops for organizations large and small around the world, and I've heard amazing stories that I will never forget. I've been privileged to work shoulder to shoulder with First Nations tribal leaders in British Columbia, students at the African Leadership University in Mauritius, forest conservation advocates in Vietnam and Thailand, and representatives of nonprofits and foundations across North America. 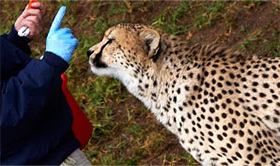 In my work with zoos and aquariums—including most recently zoos in San Diego, Houston, and Denver—I have seen stories effectively incorporated into keeper talks, guest interactions, donor presentations, and print and digital publications, and they have helped illustrate how zoos and aquariums play a critical role in the conservation of species worldwide. Without fail, all of these stories obey 10 rules that make them both unforgettable and powerful tools for motivating audiences. Follow these rules, and your stories can be just as powerful. 1. Stories are always about people. To get into a story, we need to see people with whom we can identify, or who will serve as our guide through the landscape of the narrative. No matter what your subject or message, when you tell a story, the first question in the audience's mind is, "Who is this story about?" 2. The people in your story have to want something. Once the audience knows who to focus on, their next question is, "What does he (or she) want?" At the beginning of your story, make sure it's clear what your hero desires, and give your audience a reason to care about the outcome. 3. Stories need to be fixed in time and space. Did your story happen last week or 10 years ago? Are we on a street corner in Los Angeles, a village in Rwanda, or somewhere else? Help your audience get their bearings quickly, so they can stop wondering about the "where" and "when" of your story and focus on the meaning. 4. Let your characters speak for themselves. When characters speak to each other in a story, it lends immediacy and urgency to the piece. Audience members will feel as if they are the proverbial fly on the wall within the scene, hearing in real time what each person has to say. 5. Humans bore easily. Within the first part of a story, you have to make your audience wonder, "What happens next?" or "How is this going to turn out?" As the characters in your story pursue their goal, they must run into obstacles, surprises, or something that makes the audience sit up and take notice. In short: stories don't get interesting until "I want!" runs into "You can't!" 6. Stories speak the audience's language. When telling a story, plain speaking is the order of the day. Good storytellers have a keen ear for the colloquialisms and local slang that quickly establish common ground between the teller and listener. In conversation, most people speak ungrammatically and in sentence fragments. In your stories, your characters should, too. 7. Stories stir up emotions. Human beings are not inclined to think about things they do not care about. Stories stir the emotions—not to be manipulative, not simply for melodramatic effect, but to break through the white noise of information that inundates us every day and to deliver the message: this is worth your attention. 8. Stories don't tell: they show. Intellectually, your audience will understand a sentence such as "When the nurse visited the family at home, she was met with hostility and guardedness." But if you had written instead, "When they all sat down for the first time in the living room, the family members wouldn't look her in the eye," your audience would have seen a picture, felt the hostility, and become more involved with the story. 9. Stories have at least one "moment of truth." At their essence, the best stories show us something about how we should treat ourselves, how we should treat other people, or how we should treat the world around us. Since the first humans gathered around the first fires, we have looked to stories to be containers of truth, and your audience will instinctively look within your story for this kind of insight. 10. Stories have clear meaning. When the final line is spoken, your audience should know exactly why they took this journey with you. In the end, this may be the most important rule of all. If your audience cannot answer the question, "What was that story all about?" it won't matter how diligently you followed rules one through nine. Want to learn how to improve your storytelling? The Goodman Center offers a four-week online class, "Storytelling: Tapping the Power of Narrative," expressly designed for public interest communicators. Each class runs for one hour, and the next set of classes is scheduled for March 8, 15, 22, and 29—from noon to 1 p.m. Eastern time (9 to 10 a.m. Pacific time) each day. Through a special arrangement with the San Diego Zoo Global Academy, readers of this newsletter can receive a 20 percent discount on their tuition. Click here to learn more about the course, and click here to reserve your place in the March webinar.